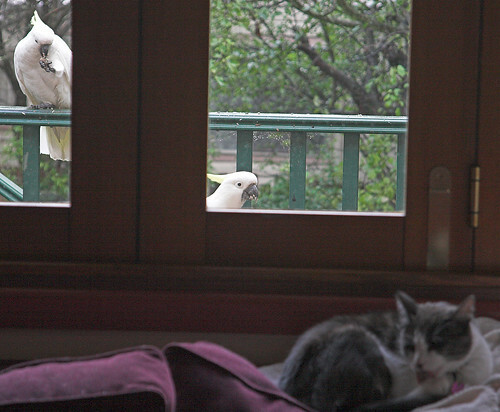 Mickey isn't actually very interested in cockatoos, on account of how large and alarming they are. When he startles them and they blast off to the safety of a nearby tree, he often seems as surprised as them. That doesn't mean they don't feel the need to keep a careful eye on him, though. Having previous close acquaintance with a Cocky I suspect the're thinking "Mmmmmmm Caaaaaaaaaaaaaaaaat"